These three recipes for gluten-free bowls are full of exotic flavors and will make you feel like you’re eating on a tropical island, even though it’s the middle of winter. They are fun and versatile to assemble, and they make a great Instagram photo. Each recipe is for a complete filling meal that will make you actually feel like you’re doing something good for yourself! I’m talking bowls, bowls, bowls of YUM! I promise these recipes will inspire you to put down that block of cheese and turkey leg. Yes, you. Plus, forget all about that snow piling up outside and start shoveling in some of these nutritious and delicious bowls of goodness. I know you will all enjoy these magnificent meals. 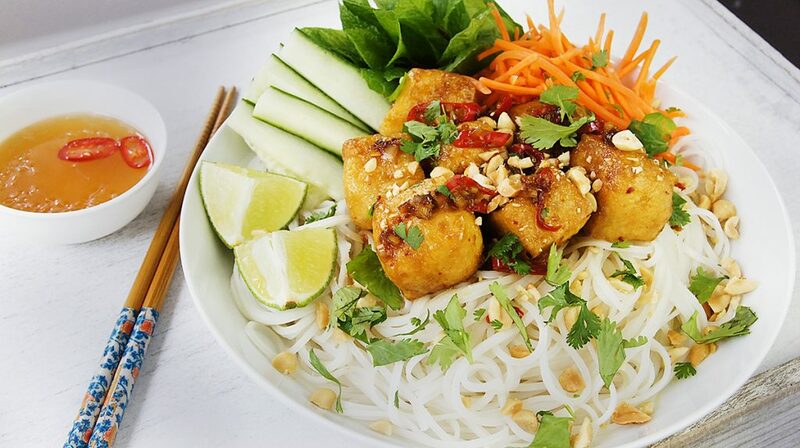 First up, we begin our exotic flavor getaway with my Spicy Lemongrass Tofu Vermicelli Bowl. This is inspired by one of my favorite dishes at my all-time-favorite Vietnamese restaurant in New Orleans. A vermicelli bowl—typically called a “Bun” at Vietnamese restaurants—contains rice noodles topped with anything from fried tofu to marinated chargrilled pork. The toppings usually include sliced carrots, cucumbers, maybe some bean sprouts and always a ton of cilantro, mint, chilies and lime. Dressings are usually fish sauce–based as well in Vietnamese cuisine, so you get a fantastic blend of salty, sweet and spicy, which is just the best in my opinion. Again, you should be able to find most of these ingredients at an Asian supermarket or in the Asian section of your local store. Be sure to look for prepackaged fried tofu chunks in the tofu section of the Asian market. If you have trouble finding this item, you can just substitute firm tofu, drained well and dredged in a bit of rice flour, if needed. It won’t be the same fried tofu texture, but it will still be delicious. Next, I wanted to continue the tropical vibe, so we are taking a lil’ trip to Hawaii with my Aloha Poke Bowl. I LOVE POKE!!! Seriously, I might need a support group or something. I could eat this every single day. And I haven’t even mentioned how darn healthy it is for you. A traditional Hawaiian dish, poke, which means “to slice,” is a delicious blend of the best things in Japanese and Hawaiian cuisines. It’s got beautifully marinated raw fish pieces on top of a bed of steamed rice and topped with everything under the Hawaiian sun. I went full-on with my toppings because that’s the way I like my poke bowls, but feel free to add or substitute anything you fancy. I know for some, the thought of handling raw fish might be a bit frightening, but I promise you as long as you get some high-quality, sushi-grade raw fish and handle it properly, you will be fine. Be sure to ask the person at the fish counter for sushi-grade raw salmon. Good Asian Markets usually have a great selection as well. If you don’t feel comfortable dealing with raw fish, substitute something else on top, like seared tuna or cooked shrimp. 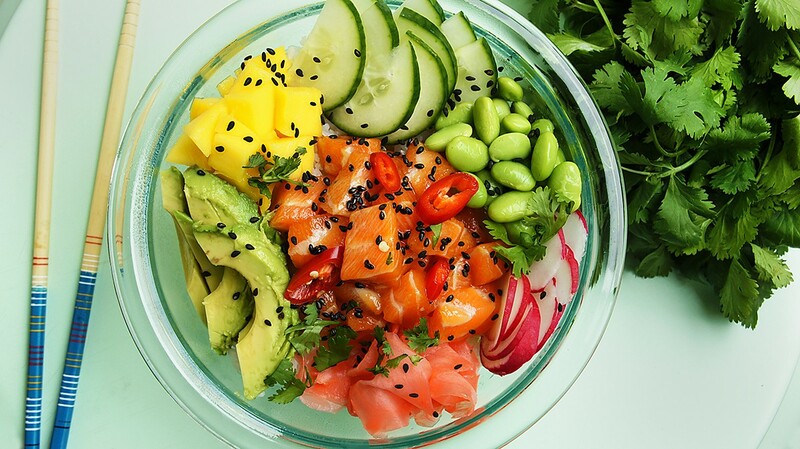 Again, have fun with this dish because that’s what poke is—a bowl of happy. You should be able to find most of these ingredients at your local Asian market or in the Asian food section of some grocery stores. 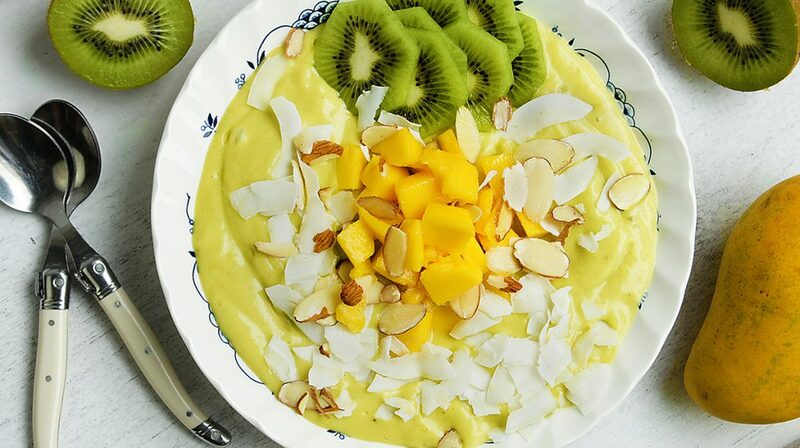 Lastly, we have my Taste of the Tropics Smoothie Bowl. This makes one huge bowl, so grab a few spoons and make some friends with this one. I absolutely LOVE smoothie bowls. They use a variety of frozen fruits, which help produce an uber-thick and creamy consistency. Feel free to get as creative as you want with both the smoothie ingredients and topping options. If you don’t love mangoes, try papaya. If almonds aren’t the nut for you, try some hemp or pumpkin seeds. Just let the tropical winds lead you on this one. I also recommend that you use a strong and powerful blender for this so you don’t blow a motor or a blade. Yes, it has happened to me in the past. I personally love a NutriBullet for things like this.